At Books and Sensibility we like to do things we probably aren't qualified for. Like judging book covers or attending the largest publishing event in North America after blogging for all of 9 months. Now we want to to talk about galley or Advanced Reader Copy (ARC) requests. Getting advanced copies isn't everything in blogging, but it can be fun to be apart of the promotion for a book you're excited about ! We want to share our tips on how we request ARCs. We don't have many chances to network with publisher connections, so our ARC request are basically like cold calls, which if you are a new book blogger you will be doing. Check out the second part here. Before contacting publishers spend at least 2-3 months building your blog with reviews and other content. That way you have something to show off when you send requests. Take this time to find out what you like to review and what upcoming releases you really want to request. These websites are the top two places to go for browsing upcoming releases and requesting e-ARCs from the Big Five and small publishers. Signing up is free and easy. Edelweiss is best for browsing publisher's catalogs. I use this to get the scoop on what's coming up next year. For tips on browsing Edelweiss check out this post from River City Reading. NetGalley is great for professional readers and bloggers to request e-ARCs. It's user friendly and has tips and advice on how to request titles. You'll find all the Big 5 publishers plus smaller and independent presses. When you sign up make sure your profile includes as much information as possible. Show them what you can do for them ! Include stats and accomplishments. While you are building up your content, entering ARC contests are a great way to get another blogger's extra review copies and to meet new bloggers. Check out giveaway hops hosted by I Am A Reader Not A Writer or Stuck in Books. Follow authors and publisher you're interested in on Twitter because many of them hold Twitter contests. If you win/receive an ARC be sure to send your review to the contact person listed in the ARC, it's a great way to get your name out there. 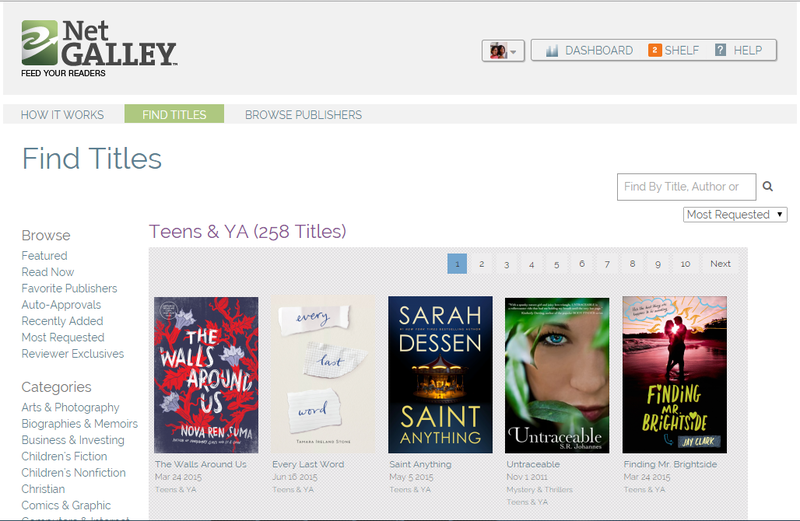 Using Netgalley and Edelweiss can help you figure out who publishes your favorite books. Do some homework ! Get to know the imprints. If you wanted an HarperTeen book you don't want to contact Harper Perennial. Do some research and browse each imprint's social media or websites to figure out their publicity e-mail or if they have a newsletter. Once you've done your research it's time to send an e-mail. Keep it short and highlight why you want to review the book and what they can expect from you. If they have to scroll to read all your e-mail, it's to long. If you want to more info add it at the end after a broiler plate (###). - Don't buy or sell galleys. They are for promotional purposes only and cost the publishers money. - Don't upload e-ARCs online for distribution. - Don't get caught up in getting ARCs. Sometimes reviewing old favorites can get you more hits than reviewing the hottest newest book before it's released. Have we missed anything ? Have any questions ? Let us know below ! Next Up : Writing That Request E-mail. This is a really helpful post, thank you! I'd like to start requesting ARCs, but I'm still not sure whether my blog would be considered ready yet... we'll see! Your blog looks great and the images are crisp and clean. I think it's worth a try to put yourself out there.